Today, I’m happy to celebrate the release of Christine’s Odyssey. I feel a special sense of accomplishment, but I’ll tell you why later on. The main character is little, but tallawah, as Jamaicans would say. In formal English, we’d say a young or insignificant person/thing that makes a big impact. To help me celebrate Christine’s Odyssey (pun intended), a group of talented authors—yes, I’ve read their work so I can use the word talented with authority—have teamed up and donated copies of their books for this blast off. My blogging buddies have also consented to help and so you'll be seeing Christine around today. Thanks guys! However, for those who’d like to win a $10.00 Amazon Gift Voucher, hop on over to the Jamaican Kid Lit Blog to enter for that. If you’re a winner, you’ll get to choose books based on how the Rafflecopter does the drawing. 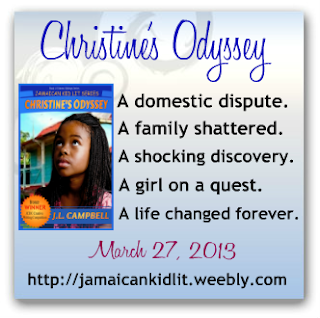 Christine’s Odyssey is available in ebook format at Amazon. One of the girls in my English class was reading Retribution. She loves it. Out of every bad situation comes something good. How much fun. I'm loving your A to Z posts. They are very informative. Thanks! out of every bad situation comes something good - Is this where I was supposed to include this?